When all new cranes are commissioned, the port of Savannah will be able to move 1,300 containers per hour. Other ongoing infrastructure improvements at Georgia ports include the Mason Mega Rail Terminal. Savannah's new neopanamax cranes are tall enough to lift containers 152 feet above the dock. Four additional neopanamax cranes sailed into the Port of Savannah recently, with a 50- by 100-foot American flag across the side. Once commissioned, the new cranes will bring Savannah’s fleet to 30. Six additional cranes will arrive in 2020. When all are commissioned, the upgrade will allow the nation’s largest single container facility to move nearly 1,300 containers per hour. “To see these massive new cranes arrive flying the stars and stripes makes us proud to be part of an operation that provides jobs and opportunity for so many,” said Georgia Ports Authority Executive Director Griff Lynch. Chief Operating Officer Ed McCarthy said the advantage of these new cranes will be multiplied by several other ongoing infrastructure improvements, including the Mason Mega Rail Terminal. 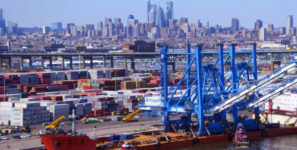 That project will double the Port of Savannah‘s annual rail lift capacity to one-million container lifts, and expand the port’s reach into the Midwest. The neopanamax cranes are tall enough to lift containers 152 feet above the dock. The booms reach out 192 feet from the dock face. Lift capacity for each crane is 72 tons. With the booms up, the cranes are 412 feet tall. The crane fleet operates over nearly 10,000 contiguous feet of dock and nine berth spaces. Upon arrival, technicians lifted and secured the boom for each crane, and completed electrical attachments, mechanical alignments and testing before the cranes are put into use. The first of the new cranes will go into service in February. Two more will be commissioned in March, with the final crane going into service in April. “This investment, totaling $47 million, will help bring in more business and support more jobs, not only for Georgia but for the entire Southeast United States,” Lynch said.